The Amish Santa Cruz Chair has a unique mission look that goes beyond the traditional Mission style. These Amish made Mission style dining room chairs look great with Mission tables or Shaker tables. This Mission chair will fit in well with your bungalow, cottage or home. When you choose an upholstered seat you can expect a soft upholstered seat in your choice of a variety of stains or fabrics. If you would like to provide your own fabric or leather that is possible. The wood seat is our standard option but the most popular selection is ordering the seat with leather upholstery. The Amish Santa Cruz Mission Dining Room Chair is handcrafted in Ohio by an Old Order Amish woodworkers out of 100% solid hardwood. Please call to speak to one of our helpful furniture specialists for questions on this Mission chair or to receive stain samples. Our Amish chairs can take between 6 to 8 week to be handcrafted for each customer. It will be well worth the wait to receive your new Mission furniture. No assembly is required for these chairs. 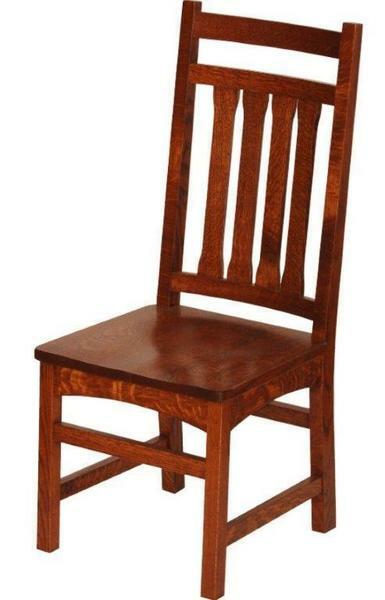 Overall Side Width: 18 ½"
Overall Arm Width: 25 ¾"
Seat Height: 17 1/2" - 18"
Upholstered Seat Height: 19" - 21"
Heavy but simple construction with straight, horizontal and vertical lines. 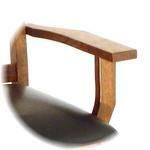 Wood seat is our standard but the most popular selection is ordering the seat with leather upholstery. Quarter sawn white oak wood or oak wood with a medium or dark stain are the most popular choice for Mission furniture. Corner block construction is used to anchor the seat to the rest of the chair. No Assembly is required for this chair. Our chairs arrived and they are perfect! Exceptional craftmanship through and through. Please pass along our gratitude to the craftsman! We are so pleased with chairs, they are beautiful as you can see. The craftsmanship is superb, not a single flaw or scratch!